You wait months for the rain to come, then when it does rain, it pours! A very wet few days 'oop North', none moreso than Wednesday when we got soaked to the skin at Newcastle, where Cuppacoco made her seasonal all-weather debut. Back at the scene of her two wins to date, Coco ran a good race to finish third after a 113 days off the track. She certainly seems to enjoy the surface and ran on well for her young jockey in a race for Apprentice riders who have ridden 10 or less winners. 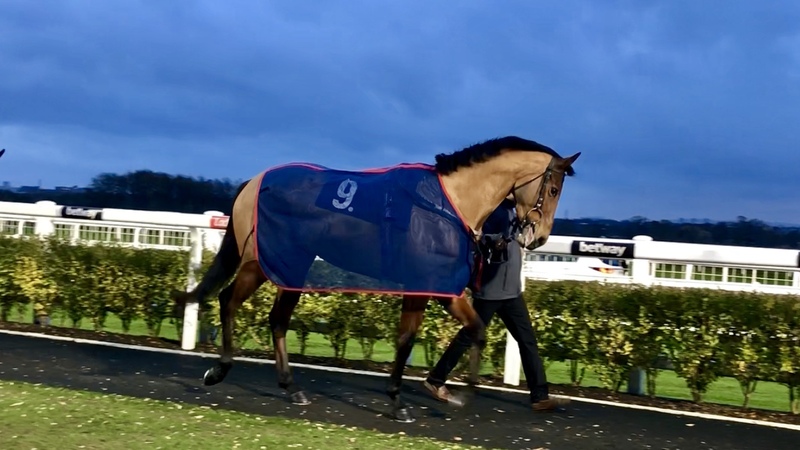 Cuppacoco is one of the most lovely characters at Sun Hill and is well liked by the staff, it would be great to see her add to her tally for owner Mrs Gledhill before the year is out. The day before was also rather unpleasant weather-wise. Thick fog and more rain for us at Southwell, where we ran Cotton Socks for the first time. His jockey, Joe Fanning, reported that the horse faced the dreaded Southwell 'kick-back' (the sand dashes off their hooves and into the faces of those behind) and seemed to take to the surface well. Again, it would be great to see him win before the end of the year for Ann Starkie. In other racing news, Sunhill Lad has received his first entry in a hurdle race. All being well, ground/weather/conditions etc permitting, he will line up at Market Rasen on Thursday. National Hunt declarations are made 24hrs ahead of time, whereas Flat are 48 so we will have a better idea come Wednesday. He has taken well to schooling, of course it is a different kettle of fish inamongst lots of other horses at an increased velocity, but he has done plenty of work at home and seems to be a natural jumper. Hopefully it is the making of him. Back to today, the 'BHG' (Big Handsome Giant), Ninepin Bowler is due to run in the 5.15pm at Newcastle. Fingers crossed he can round the month off in style and get the weekend off to a good start - best of luck to connections!